Rowing just happens to be one of the four best sports for tall, skinny guys. The sport is literally filled with tall, lean men. Maybe that’s why professional rower Michael Clougher (6’10”) and amateur Australian rower Henry Jarvis (6’7″) love their TallSlim Tees? These two tall rowers are both our brand ambassadors, so we wanted to ask them a little bit about rowing, and especially about being such tall rowers. So if you are a tall, slim guy thinking about getting into rowing, see what Michael and Henry both had to say! What are the basic mechanics of rowing? Henry Jarvis: The rowing stroke has two basic sections, each of which are broken into three movements. There’s the drive, which is putting the oar in the water, pushing the boat past it, and taking it out again, and the recovery, which is moving the body back to take the next drive. When you drive you first push with the legs, then swing your body back and then finally pull the arms in to the body. The recovery is the opposite, you move your arms away, then rock the body over and then tuck your legs back up. Most people assume rowing is an arm sport but it’s actually heavily centered around pushing with the legs. Michael Clougher: There are two main phases of the rowing stroke; the “drive” where the rower is applying force to the oar as it is in the water, and the “recovery”, where the oars are out of the water and the athlete must set themselves up for the next stroke. As a very tall rower, have you needed to make any adaptations or special considerations in your mechanics? 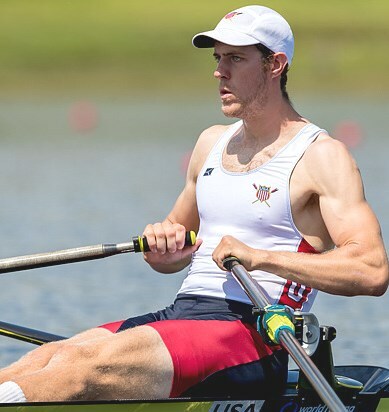 Michael Clougher: All rowers have slightly different body proportions and natural tendencies, so I believe that being tall is only one factor that contibutes to the mechanics of my own personal stroke. Henry Jarvis: Actually despite being 6’7″ I’m not considered particularly tall for a rower! If you’re taller and flexible you can reach further every stroke and you can get the most length in the water, which makes for a more efficient stroke, so tall people are very common. The only special consideration I’ve really made to my mechanics has been while sweep rowing, I’ve had to move my hands further apart to allow my arms room around my torso. Does your height impact your ability to row as part of a crew? Is there any difference between a scull and a sweep row? Henry Jarvis: The crew I row in mainly are all quite tall… between 6’4″ and 6’7″, so I don’t really have to make that many adaptions in that crew (though you always need to compromise something to keep uniformity). In some other crews I’ve had to not take strokes as long to be able to keep in time with the other guys, so that’s occasionally a thing but that’s not usually that big of a deal. Sculling is a totally different art to sweep (for those playing at home, sculling is two-oared rowing, sweep is single-oared). I keep changing in my decision of which I prefer, but at the moment it’s sweep. As a very tall fellow it lends itself to big, powerful movements where sculling is a bit more finessed, and it’s just so much fun to get a big sweep boat like an eight or a four REALLY moving. Michael Clougher: Being much taller than other members of a crew requires a little more patience to synchronize everything thogether, but I have found that taller rowers usually are able to adjust to either a sweeping or sculling crew relatviely quickly. What is your favorite part of being a rower? Michael Clougher: I just feel lucky enough to be an athlete who is able to compete at an international level, and rowing is the platform which allows me to do so. Henry Jarvis: I don’t think there’s one particular favourite thing, but I have a favourite memory. Towards the end of one of my training sessions last spring, we were training on the Yarra in Melbourne, Australia. We were facing the sunrise, and there was a mist across the dead calm of the river. I was watching behind us as we went through the arch of a bridge, and there was this moment where I could see the Melbourne Cricket Ground framed perfectly in the arch, lit up against the orange sky while the flat mist on the water was broken only by the puddle marks left by our oars. It would have been a perfect photograph but it was only those couple of moments and it was gone. It’s a completely unique view of the city that you only get as a rower. Do you have any advice to aspiring rowers who think they might be too tall for the sport? Henry Jarvis: The longer the levers the better! Rowing is a sport that favours people of height, and it’ll keep you super fit and healthy so give it a go! Michael Clougher: Many elite rowers tend to be quite tall and so aspiring rowers should see their height as an incentive to try the sport and see if they like it!